See part 1 of Frictionless economies where I discuss peer-to-peer platforms such as UBER and Airbnb and the rise of blockchain and cryptocurrencies as potential peer-to-peer exchanges of value. The world is fast. Maybe often times a little too fast. But the faster we move, the more convenient life is. People enjoy this rush of convenience–of moving quickly from point A to point B without any friction. Friction irritates people. It slows life down. Advertisements that cut short into your videos are the worst. Waiting in line at the grocery store is horrendous. Paying a restaurant bill can take longer then it took to eat your food. Or when a blog post likes to start off with anecdotes rather than cutting to the meaty section of the post. Whoops, guilty as charged. Anyways, much like Frictionless economies part 1, this is another article where I discuss how innovative thinking companies are working toward eliminating friction in the two largest economies in the world, America and China. I’ve previously discussed UBER and how they have built an app, a platform, for direct-to-consumer taxi-transportation transactions. UBER has cut out the need to call for a taxi on a busy street, fumble for exact change and cash and calculating a proper % tip (or deciding whether or not to tip at all), and instead put the power of the transaction in the consumer’s hands. But how can innovation improve this process even more? “Waymo, the secretive subsidiary of Google’s parent company, Alphabet Inc., is planning to launch the world’s first commercial driverless car service in early December, according to a person familiar with the plans. It will operate under a new brand and compete directly with Uber and Lyft. Transportation’s purpose is to get you from point A to point B.
Driverless cars, with automated GPS, is then the barebones of transportation in terms of getting individuals where they need to go. All the friction is gone. No need to give driver’s directions. No need to pay the driver. No need to figure out who will be your driver. Waymo will have the first mover advantage in this industry, while UBER will only be trying to catch up. Did you notice that Amazon now has the “Buy with one-click” option? I’ve noticed that for a while. And it’s clever. Because I’ve purchased a lot of Kindle books recently with that option and it makes the entire process so much smoother. Even on the fast web, where everything is already increasingly efficient, Amazon has cleverly removed the friction of online shopping by removing the “Shopping Cart” step. The fewer steps it takes for a consumer to arrive from “I need this item” to “Purchase decision”, the more efficiently the company has built their consumer purchase flow. Less clicks = Less friction = More purchases = More money. And Amazon taking your money. And yes, Amazon has thought of many of the loopholes of this product and closed them. For instance, you can’t press it multiple times–the Dash button responds only to your first press, and will not reorder the product until the initial order arrives. As well, to encourage adoption, the Dash Button itself is $4.99, but you will receive this money back as a credit after your first use. It’s essentially free. Did I mention FREE SHIPPING for Prime members? So imagine you have these Dash Buttons strategically placed around your home. 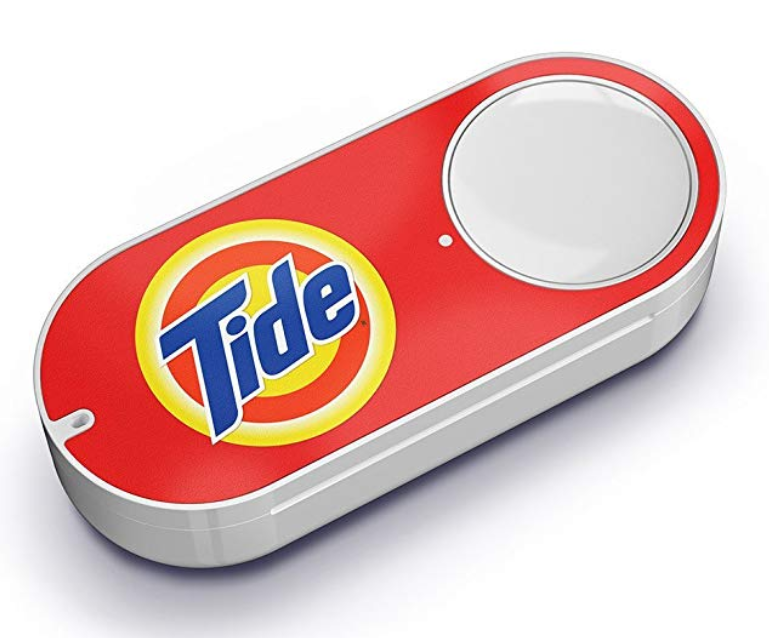 One above your laundry machine for Tide Buttons so if you notice you’re running out of laundry detergent (or whichever brand you use), you simply press the Dash button, and a stock of your favorite brand will arrive at your doorstep within 2-days and with free shipping for Prime Members. Or you have a favorite snack that you literally go through every week. Place a Dash Button on the inside of your cupboard where you put your favorite snacks. Again, it’s that easy! Really, the amount of products that you can set-up with a Dash Button is limitless. Toilet paper? Batteries? Toothpaste? Pet snacks? It’s really genius because these are all products that everyone needs in constant re-stock. 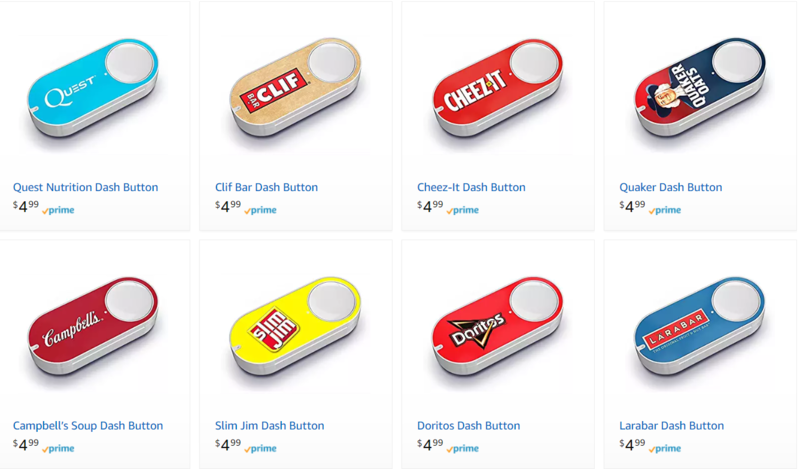 The amount of transactional friction that Amazon has eliminated with these Dash Buttons makes me gush approval. It’s every economist’s dream! CHINA: SHOULD I SCAN YOU, OR SHOULD YOU SCAN ME? I spent my 7 weeks working a full-time internship this past summer in China. And wow. The power of a smartphone in China is truly unparalleled. America might have invented the smartphone, with Apple propelling the innovation forward, but China has injected the smartphone with so much more utility. QR Codes are everywhere, and all you need to do is scan them with your smartphone and a myriad of options come to your hands. So, should I scan you, or should you scan me? A classic cheesy pickup line that is very relevant in China. Scan someone’s QR code and you’re immediately connected through the WeChat App (created by Tencent, the world’s 5th most valuable company, used by over 1billion Chinese as the go-to social media platform). SnapChat has the same frictionless way of connecting with someone. The two very important differences are that China’s WeChat is used by nearly everyone and that it’s also used for many other services aside from social networking, the other primarily being for payments. The WeChat App alone can be used for messaging (Facebook Messenger), posting photos and connecting with other people’s pages (Instagram), or you can easily send money to friends and family (Venmo), scan a restaurant’s receipt or QR code on the side of the table to pay for your meal (Apple Pay? Sort of?). QR codes have made it increasingly convenient to make digital money transactions through WeChat and Alibaba’s Alipay. Paying for your meal at a restaurant has never been easier since you can literally just scan the QR code on your table, pay, and walk out, instead of having to wait awkwardly for your server to come to give you the bill, get change, or if you use a card, return so you can sign the receipt. Go to a convenience store, grab what you want, scan the QR code on the wall, and then just leave. Show your phone as proof to the cashier and you’re good to go. Did I mention that metropolitan cities in China are polluted.., with share bikes? If you’ve been to New York, you’ve probably seen these Citibikes docked every few blocks. In China, they have the same thing, except they aren’t docked, they are just everywhere on the streets. Easy enough to pick one up, scan the QR code to activate the bike, and then just drop it off anywhere you want when you’re done riding. Retail is dying, everyone says. And it’s being killed by Amazon. But wait. Amazon is opening its own retail stores? Why? Amazon is king at creating frictionless economies, and even in the big scary world of retail, they’ve managed to create something potentially beautiful. What’s the worst part of shopping in retail stores nowadays, and causes the most friction? The point of purchase. The cash register. “Amazon is testing a grocery store in downtown Seattle that lets customers walk in, grab food from the shelves and walk out again, without ever having to stand in a checkout line. Customers tap their cell phones on a turnstile as they walk into the store, which logs them into the store’s network and connects to their Amazon account through an app. But it’s not just Amazon that’s trying to reinvent retail. Alibaba, which is often hailed as the Amazon of China (but really, they are more like Amazon, eBay, Venmo/Paypal combined), is also reinventing the retail industry in Asia with their own cashier-less stores. The Hema App can scan barcodes of items in the grocery store to receive basic details, price, trace to origins, and other valuable data about grocery products. Live nearby? Order your usual basket of goods and get it delivered in 30 minutes! Gimmicky? A bit. But definitely cool. The future is exciting with these frictionless economies popping up left and right. Tinder. UBER. Airbnb. Blockchains and cryptocurrencies. Waymo. E-commerce. One-click shopping. QR codes. Robots and AI. And although you might be wondering: are frictionless economies just encouraging less human interaction? In a way, yes, but it also means we now have more room to build efficient lives and spend more time doing work that matters. Frictionless economies will open up an entirely new world where people need to adapt to. It’s a service world and a technology era. It’s a future where we need to be educated and skilled in diverse and broad areas. I’m excited about a frictionless economy; it’ll make life more efficient. But it also means we need to be aware. We need to stay ahead of the game.